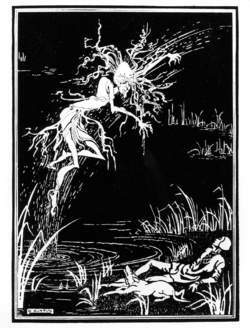 Illustration, by Doris Burton, of the hag of Blackwater Mere. Courtesy Fortean Picture Library. Term sometimes applied to the Crone aspect of the Triple Goddess. She represents Wisdom, although, at times, she can seem to be terrible, as when she is in character as the Gateway to Death. Rosemary Guiley suggests that the origin of the term may be found in the Egyptian heq, who was a matriarchal ruler of predynastic times who knew the Words of Power. From the Old Norse, there is hagi, a "sacred grove," and haggis, or "Hag's dish," which is a mixture of organ meats that is still served today. In Scottish Witchcraft, the goddess Cailleach, the "Mother of All," was often depicted as a hag with the teeth of a bear or the tusks of a wild boar. She was reputed to be a great worker of spells. Fragmentary accounts survive of how she created the earth, fashioning the hills and the lochs, the valleys and the mountains. In Scotland, also, is the New Year custom of Hogmanay, which stems from the pagan Yule celebrations. "Hogmanay" comes from Hagmenai, or Hag's Moon, signifying the last night of the old year. Couples and families would celebrate the night together, making a point of not parting till after midnight, when they would do so with a kiss. Barbara Walker says that Hag originally meant "holy woman." In Greece, she became Hecate, the Queen of the Dead. As such she wore a veil over her face, so that no one would know the manner of their death. Old High German uses Hagazussa, or "Moon Priestess," to describe a wise woman, while in the sixteenth century "hag" was synonymous with "fairy." Robert Graves speaks of the "Hag of the Mill" which, he says, is another name for the White Goddess, and states that the Greeks called her "Alphito, Goddess of the Barley Flour." In England, a hag is a hedge enclosing a field or pasture and it is also a term applied to a cut-like gap or ravine in a mountain. This latter may be because of its serpentine-like meandering. In England, there is a mound named Hagpen, where "hag" meant serpent and "pen" meant hill. It seems possible that hag could mean both serpent and dragon. Hag is a name for the slime-eel, a snake-like fish related to the lamprey. These meanings are related to beliefs that the serpent represents earth energy, as seen in ley lines and so-called dragon lines. There would, then, seem to be a correlation between Hag, Serpent, and Earth Mother.